With the weather change we are moving from easy and grilled meals to more hearty, filling ones. I couldn't take it any longer, Saturday for lunch I had to make Chili Over Fritos. Such a Fall/Winter meal, it's one of my family's favorites. Blanket scarves! I don't have one but it is definitely on my list of must haves this fall! That and some cute booties! Working on the basement, doing yard work, getting geared up for the arrival of the little girl. I'm dreading hunting season. It starts October 17th. Hopefully Andy will get a deer the first weekend and won't be gone too much. Last year he called me about 30 minutes after hunting season started and told me he got one. We didn't need meat last year so he gave it to his brother, which meant he didn't have to clean or cut it up either. Easiest, fastest hunting season ever! I'm working on the baby's room and have the material to start working on a blanket for her. My mom is making the most awesome blanket for Sweet Pea but I just couldn't resist making her one myself. It gives me so much joy to see how loved the blankie is that I made for Tate, I'm excited to see that again with this little gal. I'm excited about 'October'. Such a great month! Also, excited about FINALLY finishing up the boys' rooms and decorating Baby Girl's room. I'm excited to get a good chunk of my Christmas shopping done - want to be 90% done before the baby arrives. I'm excited that the boys will be excited for Halloween. I'm excited to watch some more Hawkeye football. I could go on and on. I am so ashamed, I haven't read a book in months. It used to be that I couldn't keep enough books around, but now? I can't seem to bring myself to pick one up. It's not even about the reading, it's just about the starting. It won't get better with a newborn around, either. Oh well, there will be time to read again someday. For now I'll enjoy playing with my babies instead. As for watching, football. It's football season and we watch it every chance we get. These boys, they've turned me into a sports fan! :) I'm also watching RHOC, just finished up the last season of Dallas Cowboys Cheerleaders, and Andy and I watch Ink Master on Tuesday nights. 2 songs - Eric Church's "Wrecking Ball" and Luke Bryan's "Strip It Down". If you haven't listened to either of these you MUST! I am not a Luke Bryan fan but this song, da-yum! They both get my motor running, lol! Jeans! It cooled back down Tuesday, highs in the mid 60's, and I am loving wearing jeans again! I also can get out my 3/4 sleeve maternity shirts, hallelujah! I'm so tired of the rest of the stuff I've been wearing since April! Well, not a whole lot. Andy's at his annual guy's Iowa game so I haven't figured out anything fun for me and the boys to do yet. Aiden needs new church shoes so who knows, maybe we'll run to the big city and do a little shopping. And Sunday we are celebrating my nephew's 11th birthday. Gosh, 11. Did I just say that? I used to beg my sister to let me keep Charley once a week (or more) when he was born, we had so much fun together! I lived about 3 blocks from the school my sister taught at so we walked up there so her class could meet their teacher's baby. I loved that time with him. Next month is October, and I'm looking forward to all things 'Fall'. I'm also looking forward to enjoying the last few weeks of my pregnancy. I've said before how much I love being pregnant, and I do, so when it gets down to the last few weeks I get sentimental and sad about it all being over. I'd much rather hold my sweet baby in my arms than be pregnant, but still. I'll miss it. Somehow I got roped into planning a 5k run. Me, someone who has never ran or attended one before, planning the darn thing! I have 2 gals helping me but they have claimed I'm the one in charge. Oi. The run is a Glow Run, Saturday October 24th. That will occupy my mind for these next few weeks. We are organizing this for a fundraiser, I am on a committee that's focus is beautifying our little town. Our first real project is to update and improve the trailhead of a trail that connects our town and two others. Currently the trailhead runs through a gravel parking lot between a bunch of anhydrous tanks. Sounds welcoming, right? So, we are purchasing just over an acre of land to re-route the end/beginning of the trail. There will be a shelter with a picnic area, restrooms, a nice paved parking lot and the trail will be paved for a short distance. I believe our little project will cost just shy of $500,000 - that's not a small task raising that amount of money in this tiny little town. We have applied for grants and other funding so fingers crossed we can get a good chunk of that money raised so we can break ground next year. Thus the fundraiser 5k. Not that the 5k will really raise us *that* much money, but we are hoping to build on it every year from here on out and to use those funds for this and other projects around the community. I've been told the first year won't be a huge success but not to give up, each year following it will get more and more participants. We thought it'd be good to do it later in October, the runs are dwindling and people are wanting to get one last 5k in. We'll see. Any good mojo you can send us would be appreciated! Halloween is not a very big holiday for us here at the McGuire house. I don't love it so have never gotten too hyped up over it. But, our tradition every year is to go Trick or Treating to the grandparents, aunts/uncles, and great grandma's houses, then do a couple of streets/house to house treating in our hometown. This year, though, things might be changed up a bit since Halloween is a Saturday and the town we live in is having trick or treating on Friday the 30th instead. Not sure what our plan is going to be, but guessing we will TorT here in this town for something different, then Saturday go visit the family houses. What are you Halloween traditions?? 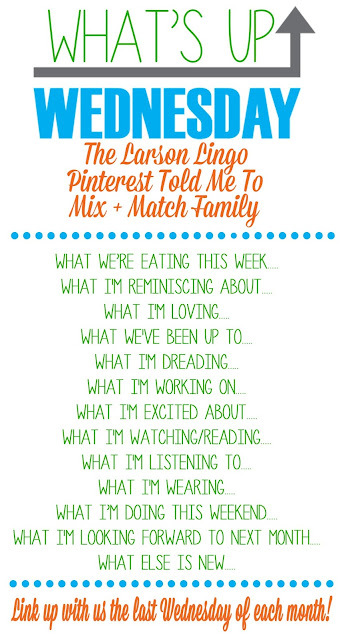 Go link up with the gals and share your answers to "What's up Wednesdays"! Lucky your husband only gets one deer tag... my husband gets 3-4 and a landowner's tag. We live off deer meat (and share with his twin and dad who hunt too) so we never want to run out. Last year Tim got three deer. I am dreading it this year because I will be on maternity leave and while he is in the woods napping, because you know they aren't awake the WHOLE time, I will be at home with a toddler and a new born. DYING to see these rooms you've been working on. Loved the little peek this weekend - but I'm ready to see ALL of the rooms! You're killing me with your Fall weather. It's "cooling" down this weekend to upper 70s/low 80s. Lame.